For Italian football team, see Tritium Calcio 1908.
, also known as hydrogen-3) is a radioactive isotope of hydrogen. The nucleus of tritium (sometimes called a triton) contains one proton and two neutrons, whereas the nucleus of protium (by far the most abundant hydrogen isotope) contains one proton and no neutrons. Naturally occurring tritium is extremely rare on Earth, where trace amounts are formed by the interaction of the atmosphere with cosmic rays. It is produced by irradiating lithium metal in a nuclear reactor. 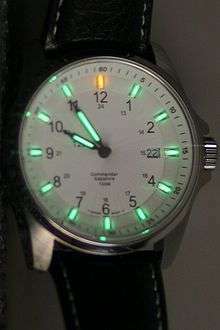 Tritium is used as a radioactive tracer, in radioluminescent light sources for watches and instruments, and in nuclear weapons. The name of this isotope is formed from the Greek word τρίτος (trítos) meaning "third". Tritium is produced in nuclear reactors by neutron activation of lithium-6. This is possible with neutrons of any energy, and is an exothermic reaction yielding 4.8 MeV. In comparison, the fusion of deuterium with tritium releases about 17.6 MeV of energy. The reactions requiring high neutron energies are not attractive production methods for peaceful applications. Tritium is an uncommon product of the nuclear fission of uranium-235, plutonium-239, and uranium-233, with a production of about one atom per each 10,000 fissions. The release or recovery of tritium needs to be considered in the operation of nuclear reactors, especially in the reprocessing of nuclear fuels and in the storage of spent nuclear fuel. The production of tritium is not a goal, but rather a side-effect. In January 2014 it was made public that a total of 875 TBq (2.45 g) of tritium are on the site of Fukushima Daiichi, and the amount of tritium contained in the contaminated water is increasing by approximately 230 TBq (0.64 g) per year. According to a report by Tepco "Tritium could be separated theoretically, but there is no practical separation technology on an industrial scale." Tritium's decay product, helium-3, has a very large cross section for reacting with thermal neutrons, expelling a proton, hence it is rapidly converted back to tritium in nuclear reactors. Worldwide, the production of tritium from natural sources is 148,000 terabecquerels per year. The global equilibrium inventory of tritium created by natural sources remains approximately constant at 2,590,000 terabecquerels. This is due to a fixed production rate and losses proportional to the inventory. The production of tritium was resumed with irradiation of rods containing lithium (replacing the usual control rods containing boron, cadmium, or hafnium), at the reactors of the commercial Watts Bar Nuclear Generating Station in 2003–2005 followed by extraction of tritium from the rods at the new Tritium Extraction Facility at the Savannah River Site beginning in November 2006. Tritium leakage from the rods during reactor operations limits the number that can be used in any reactor without exceeding the maximum allowed tritium levels in the coolant. Tritium's specific activity is 9,650 curies (3.57×1014 Bq) per gram. Tritium is an isotope of hydrogen, which allows it to readily bind to hydroxyl radicals, forming tritiated water (HTO), and to carbon atoms. Since tritium is a low energy beta emitter, it is not dangerous externally (its beta particles are unable to penetrate the skin), but it can be a radiation hazard when inhaled, ingested via food or water, or absorbed through the skin. HTO has a short biological half-life in the human body of 7 to 14 days, which both reduces the total effects of single-incident ingestion and precludes long-term bioaccumulation of HTO from the environment. Biological half life of tritiated water in human body, which is a measure of body water turn over, varies with season. Studies on biological half life of occupational radiation workers for free water tritium in the coastal region of Karnataka, India show that the biological half life in winter season is twice that of the summer season. Tritium has leaked from 48 of 65 nuclear sites in the US. In one case, leaking water contained 7.5 microcuries (0.28 MBq) of tritium per litre, which is 375 times the EPA limit for drinking water. The US Nuclear Regulatory Commission states that in normal operation in 2003, 56 pressurized water reactors released 40,600 curies (1.50 PBq) of tritium (maximum: 2,080; minimum: 0.1; average: 725) and 24 boiling water reactors released 665 curies (24.6 TBq) (maximum: 174; minimum: 0; average: 27.7), in liquid effluents. According to the U.S. EPA, "a recently documented source of tritium in the environment is [self-illuminating] exit signs that have been illegally disposed of in municipal landfills. Water, which seeps through the landfill, is contaminated with tritium from broken signs and can pass into water ways, carrying the tritium with it." The American limit is calculated to yield a dose of 4.0 millirems (or 40 microsieverts in SI units) per year. This is about 1.3% of the natural background radiation (roughly 3000 microsieverts). The emitted electrons from the radioactive decay of small amounts of tritium cause phosphors to glow so as to make self-powered lighting devices called betalights, which are now used in firearm night sights, watches, exit signs, map lights, knives and a variety of other devices. This takes the place of radium, which can cause bone cancer and has been banned in most countries for decades. Commercial demand for tritium is 400 grams per year and the cost is approximately US $30,000 per gram. Actuated by an ultrafast switch like a krytron, a small particle accelerator drives ions of tritium and deuterium to energies above the 15 kilo-electron-volts or so needed for deuterium-tritium fusion and directs them into a metal target where the tritium and deuterium are adsorbed as hydrides. High-energy fusion neutrons from the resulting fusion radiate in all directions. Some of these strike plutonium or uranium nuclei in the primary's pit, initiating nuclear chain reaction. The quantity of neutrons produced is large in absolute numbers, allowing the pit to quickly achieve neutron levels that would otherwise need many more generations of chain reaction, though still small compared to the total number of nuclei in the pit. Since tritium undergoes radioactive decay, and it is also difficult to confine physically, the much larger secondary charge of heavy hydrogen isotopes needed in a true hydrogen bomb uses solid lithium deuteride as its source of deuterium and tritium, where the lithium is all in the form of the lithium-6 isotope. During the detonation of the primary fission bomb stage in a thermonuclear weapon (Teller-Ullam staging), the sparkplug, a cylinder of U235/P239 at the center of the fusion stage(s), begins to fission in a chain reaction, from excess neutrons channeled from the primary. The neutrons released from the fission of the sparkplug split lithium-6 into tritium plus helium-4 and lithium-7 into helium-4 plus tritium plus one neutron. As these reactions occur, the fusion stage is compressed by photons from the primary and fission of the U-238 or U-238/U-235 jacket surrounding the fusion stage. Therefore, the fusion stage breeds its own tritium as the device detonates. In the extreme heat and pressure of the explosion, some of the tritium is then forced into fusion with deuterium, and that reaction releases even more neutrons. splitting are net neutron producers), lithium deuteride is not used in boosted bombs, but rather, for multistage hydrogen bombs. Aside from chlorofluorocarbons, tritium can act as a transient tracer and has the ability to "outline" the biological, chemical, and physical paths throughout the world oceans because of its evolving distribution. Tritium has thus been used as a tool to examine ocean circulation and ventilation and, for such purposes, is usually measured in Tritium Units where 1 TU is defined as the ratio of 1 tritium atom to 1018 hydrogen atoms. As noted earlier, nuclear weapons testing, primarily in the high-latitude regions of the Northern Hemisphere, throughout the late 1950s and early 1960s introduced large amounts of tritium into the atmosphere, especially the stratosphere. Before these nuclear tests, there were only about 3 to 4 kilograms of tritium on the Earth's surface; but these amounts rose by 2 or 3 orders of magnitude during the post-test period. The impacts of the nuclear fallout were felt in the United States throughout the Mississippi River System. Tritium concentrations can be used to understand the residence times of continental hydrologic systems (as opposed to the usual oceanic hydrologic systems) which include surface waters such as lakes, streams, and rivers. Studying these systems can also provide societies and municipals with information for agricultural purposes and overall river water quality. ↑ Lucas, L. L. & Unterweger, M. P. (2000). "Comprehensive Review and Critical Evaluation of the Half-Life of Tritium" (PDF). Journal of Research of the National Institute of Standards and Technology. 105 (4): 541. doi:10.6028/jres.105.043. 1 2 3 4 Zerriffi, Hisham (January 1996). "Tritium: The environmental, health, budgetary, and strategic effects of the Department of Energy's decision to produce tritium". Institute for Energy and Environmental Research. Retrieved 15 September 2010. ↑ Jones, Greg (2008). "Tritium Issues in Commercial Pressurized Water Reactors". Fusion Science and Technology. 54 (2): 329–332. ↑ Sublette, Carey (17 May 2006). "Nuclear Weapons FAQ Section 12.0 Useful Tables". Nuclear Weapons Archive. Retrieved 19 September 2010. ↑ Whitlock, Jeremy. "Section D: Safety and Liability – How does Ontario Power Generation manage tritium production in its CANDU moderators?". Canadian Nuclear FAQ. Retrieved 19 September 2010. 1 2 "Tritium (Hydrogen-3) – Human Health Fact sheet" (PDF). Argonne National Laboratory. August 2005. Retrieved 19 September 2010. ↑ Serot, O.; Wagemans, C.; Heyse, J. (2005). "New Results on Helium and Tritium Gas Production From Ternary Fission". International conference on nuclear data for science and technology. AIP Conference Proceedings. 769: 857–860. doi:10.1063/1.1945141. ↑ "Helium-3 Neutron Proportional Counters" (PDF). mit.edu. ↑ "Radiation Information Network's Tritium Information Section". Idaho State University. ↑ OSEH: Radionuclide Safety Data Sheets – H-3. Oseh.umich.edu. Retrieved on 2013-03-20. ↑ Singh, V. P.; Pai, R. K.; Veerender, D. D.; Vishnu, M. S.; Vijayan, P.; Managanvi, S. S.; Badiger, N. M.; Bhat, H. R. (2010). "Estimation of biological half-life of tritium in coastal region of India". Radiation Protection Dosimetry. 142 (2–4): 153–159. doi:10.1093/rpd/ncq219. PMID 20870665. ↑ Singh, V. P.; Pai, R. K.; Veerender, D. D.; Vishnu, M. S.; Vijayan, P.; Managanvi, S. S.; Badiger, N. M.; Bhat, H. R. (2010). "Estimation of biological half-life of tritium in coastal region of India". Radiation Protection Dosimetry. 142 (2–4): 153–9. doi:10.1093/rpd/ncq219. PMID 20870665. ↑ "Tritium in drinking water". Canadian Nuclear Safety Commission. 3 February 2014. Retrieved 2015-10-27. ↑ "Backgrounder on Tritium, Radiation Protection Limits, and Drinking Water Standards". US NRC. 15 March 2011. Retrieved 10 February 2012. ↑ Willms, Scott (14 January 2003). "Tritium Supply Considerations" (PDF). Los Alamos National Laboratory. Retrieved 1 August 2010. 1 2 3 4 5 6 7 8 Jenkins, William J. et al, 1996: "Transient Tracers Track Ocean Climate Signals" Oceanus, Woods Hole Oceanographic Institution. 1 2 3 4 5 Doney, Scott C. (1992). "Bomb Tritium in the Deep North Atlantic". Oceanography. 5: 169–170. doi:10.5670/oceanog.1992.11. ↑ Michel, Robert and Peter M. Williams (1973). "Bomb-produced tritium in the Antarctic Ocean". Earth and Planetary Science Letters. 20 (3): 381–384. doi:10.1016/0012-821X(73)90013-7. 1 2 3 4 Kakiuchi, H.; Momoshima, N.; Okai, T.; Maeda, Y. (1999). "Tritium concentration in ocean". Journal of Radioanalytical and Nuclear Chemistry. 239 (3): 523. doi:10.1007/BF02349062. 1 2 3 4 5 6 7 Fine, Rana A.; Reid, Joseph L.; Östlund, H. Göte (1981). "Circulation of Tritium in the Pacific Ocean". Journal of Physical Oceanography. 11: 3–14. Bibcode:1981JPO....11....3F. doi:10.1175/1520-0485(1981)011<0003:COTITP>2.0.CO;2. 1 2 3 4 5 6 7 8 9 10 Michel, Robert L. (2004). "Tritium hydrology of the Mississippi River basin". Hydrological Processes. 18 (7): 1255. Bibcode:2004HyPr...18.1255M. doi:10.1002/hyp.1403. ↑ Oliphant, M. L.; Harteck, P.; Rutherford (1934). "Transmutation Effects observed with Heavy Hydrogen". Nature. 133 (3359): 413. Bibcode:1934Natur.133..413O. doi:10.1038/133413a0. ↑ Oliphant, M. L. E.; Harteck, P.; Rutherford, L. (1934). "Transmutation Effects Observed with Heavy Hydrogen". Proceedings of the Royal Society A: Mathematical, Physical and Engineering Sciences. 144 (853): 692. Bibcode:1934RSPSA.144..692O. doi:10.1098/rspa.1934.0077. ↑ Alvarez, Luis; Cornog, Robert (1939). "Helium and Hydrogen of Mass 3". Physical Review. 56 (6): 613. Bibcode:1939PhRv...56..613A. doi:10.1103/PhysRev.56.613. ↑ Alvarez, Luis W; Peter Trower, W (1987). Discovering Alvarez: selected works of Luis W. Alvarez, with commentary by his students and colleagues. pp. 26–30. ISBN 978-0-226-81304-2. ↑ Kaufman, Sheldon; Libby, W. (1954). "The Natural Distribution of Tritium". Physical Review. 93 (6): 1337. Bibcode:1954PhRv...93.1337K. doi:10.1103/PhysRev.93.1337.